Thanks for the tip! I'm trying to run it on a port I thought they kept open, but it's still not working. If I try to use the Broadcast or Request channels, it tells me that the message could not be sent because there was an error joining zone chat. Running it on port 80 caused the client to get stuck at the "Connecting..." phase, so that's out. In short, don't uplink to your campus network. Hah! Well, we had to do something for our project on these VMs... and this has definitely been a learning experience. Hope isn't lost entirely, I still have a few options left. I'll let you know if I do end up getting it to work. And thanks again for the assistance. Update: private chat/tells are working. But zone chat and mapmove aren't working. EDIT: mapmove is working, I'm just dumb and used the wrong numbers. I deleted my entire installation - Tequila, Paragon Chat, Pidgin, and Openfire; and updated all of it to the current release versions. I have Openfire running on my local Windows 10 workstation. I can access things fine using Pidgin and create rooms and what not. When Paragon Chat connects, it creates a global connection to the server, but it never connects to the conference instance and so never attempts to connect to the appropriate channels - paragonchat, atlaspark and atlaspark_meta. This same installation of Paragon Chat connects fine to Titan's server. 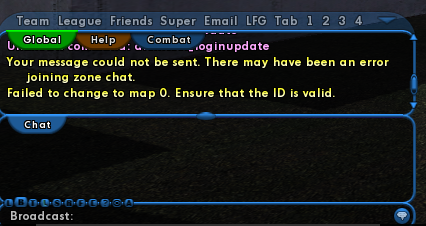 Likewise, like @Patch, /mapmove works as expected as far as changing environment to the designated map, but no connection to the appropriate chat channels is attempted. PCC INFO: Client is now fully initialized and ready! xmpp DEBUG Reopened stream successfully. xmpp DEBUG Session establishment successful. I tried deleting the default conference MUC and even naming the replacement 'paragon', like Titan, to no avail. Openfire is just a vanilla installation with a single registered user; me. As I mentioned, Pidgin can access things just fine. It looks like discovery is broken somehow. But for whatever reason your Openfire install is saying there aren't any services available. That doesn't look right; pubsub is built in so that should at least be listed. Is Pidgin able to see the MUC service / any rooms? Pidgin and Spark both work. It's a strange thing. Stranger yet - Installing the Linux version created identical results. The debug log looks nearly identical, other than the host names. Either it's a bug in the current version of Openfire, or it's some obscure firewall/network interference. Since I'm the sysadmin here and have direct control over the firewall and network, I'm skeptical about the firewall option though I can't entirely rule it out given that it would by definition be something I was unaware of. Further conversation about this will be moved to the support thread where it belongs. I expect to make a post there shortly. I guess what I'll do next is get everything downloaded again on to a fresh machine on my home network and see if that works as expected. I tried repairing it uninstalling it and trying to re install it please someone help me get my paragon chat back up and running!! Unsure what to do at this point. I recall helping a few friends get their systems set up, but that was 4 years ago already. Also, when downloading from scratch via Tequila, it does take A Really Really Long Time to get ALL the files reloaded - so be patient. The downloads will complete probably about an hour after you've decided "it's taking way too long, something must be wrong". Tequila is not a Titan Network project, it belongs to SaveCOH.com. But we've told users to use the client to get the files, so if we didn't endorse it, we're doing a lousy job. We make it clear that we don't run Tequila to manage support expectations. Codewalker, TonyV and Sekoia are the wrong folks to ask to fix it. That's all. First things first. Thank you for making this possible. To fly again... glorious! As I recreated my long time toons and got their look just so, I was amazed at how close it was to the original. I took each one on a tour of their old haunts and spots, with a giant smile on my face at being able to see it all again. Now for the kvetch. OMG, it hurts. It was sad enough when they shut down the last server. I was in the mob right below the statue, three steps down and two toons from the center... torch held high as the world went dark. The game was gone and I couldn't play it anymore. I saw this and it got better. I could go back in the world and see it as it was. Except it's empty and barren. The NPC's don't talk back, the mobs are gone and even if they were there, the ability to smack them around a little for old time sake is not available. Please just let me know that someone somewhere is trying to get the world back that we knew. To be able to see it all again and still not be able to play is like losing it all over again. I could go back in the world and see it as it was. Except it's empty and barren. The NPC's don't talk back, the mobs are gone and even if they were there, the ability to smack them around a little for old time sake is not available. Please just let me know that someone somewhere is trying to get the world back that we knew. To be able to see it all again and still not be able to play is like losing it all over again. Except it's empty and barren. The NPC's don't talk back, the mobs are gone and even if they were there, the ability to smack them around a little for old time sake is not available. Please just let me know that someone somewhere is trying to get the world back that we knew. To be able to see it all again and still not be able to play is like losing it all over again. One of the reasons why not is that all of that is NCSoft's intellectual property. In addition, the logistics of adding all of that back when absent of gameplay being available, it's a lot of effort for something you can't use. Also, the amount of work to return the 'feel' of the game is a moving yardstick. Ignoring the technical limitations (the first one is just as hard as restoring combat to Paragon Chat...) To some, just having citizens walking the streets is enough. To others, the NPCs make and break the city, so they all need to talk. To others, 'missions' need to exist, even without combat as an option. Finally, there's some who think part and parcel isn't enough, it's all or nothing. Every bit of the game needs to come back... or forget it. There are no wrong answers, but balancing what people want versus what is possible for a developer to do in their spare time away from other obligations... that's the rub. Parts and pieces are coming back. Development is continuing. That's the good news. You can visit with us if you like. If you don't want to, you're still a City of Heroes veteran and welcome here either way. First of all, Welcome!! to Paragon Chat! In regards to the city being Empty, there are weekly player events, such as the Thursday night Costume Contests in Atlas Park, with a different theme each week. (Next week's Theme is: Chinese New Year). At those folks gather to compete or just watch and chat, and we hang around and talk afterwards. Plus, we also have Casual Thursday RP each week, usually in Pocket D following the Costume Contests. AND - base building was just restored this past year, and many of us are busy beavers rebuilding / creating anew our bases. So, true, there's no combat, no talking NPCs, no cars driving around on the streets. But we're here. Check out the activities schedules, and come look us up. We'll be happy to see you! Unfortunately, the best avenue to getting City of Heroes working in Linux, Cedega, is now gone. There was a point several years in, sometime after Cedega morphed/merged into TransGaming, that I experienced some glitching or brokenness, and attempted to use wine, with some tweaks (read: winetricks). Turns out that wine had caught up with the code for CoH enough that it was very functionally playable, and thanks to the help of those who were on top of major changes to CoH's launcher, and the .Net "upgrades", I was able to play until the very end of the servers. I eventually tried running ICON via wine, with some success. I could freely tour the empty streets of Atlas Park, Mercy Island, or Nova Praetoria, and explore the in-zone building interiors hidden beneath those streets, using noclip and other tools provided. But any attempt to load any other zone from within the game would result in a crash, which I could never solve. Some more recent code update, probably to wine itself, has made ICON unusable, and when I finally attempted to load Paragon Chat, I encounter the same issue. The game UI loads quite nicely, but when I click on the icons within the UI to advance to or through the character creations process, the game does not register the mouse-clicks. The cursor causes the icons to react properly, displaying pop-up text or causing the icon to grow under the cursor, but that's it. My attempts to use various versions of wine, and winetricks, winecfg and regedit adjustments have fallen short. I'm sure there's a winetricks fix somewhere, but I don't know where to begin to look. I was mystified by the click issue for way too long. Turns out installing Dinput8 fixed it.